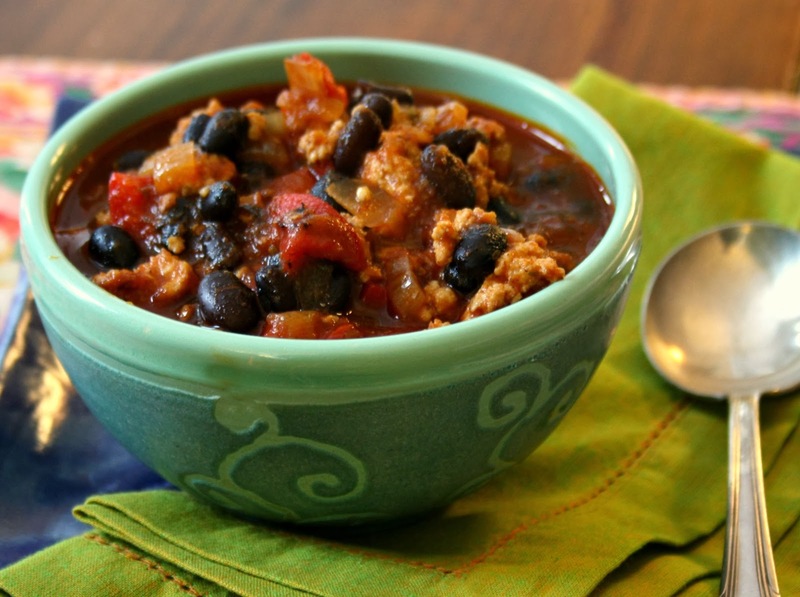 Healthy black bean turkey chili is hearty and wholesome. Just the thing for a cold winter day. I spent my childhood winters skiing at Poley Mountain. Dad would pile us in the car with a big picnic lunch and away we’d go for the day. Those were the days before chairlifts so there were epic line ups for the t-bar and the occasional pile up on the t-bar run if someone’s ski went astray. Somehow dad would get us off the mountain and back to town in time for Saturday suppertime mass but we never had time to change so we'd still be in our snow pants and ski boots, clomping up the aisle of the church. Then we’d head home for supper. Although this is a new recipe by mom standards it’s the sort of recipe we’d come home to after skiing. Hot, hearty and served with cornbread, it’s just the sort of supper that’s perfect after a winter day spent outside. This recipe is great with chopped carrots added too (sauté them with the onions and peppers). We make it with pasture-raised turkey that we're able to buy locally. Buy dried beans for the best flavour and texture. You can soak a big batch overnight and cook them when you have time. Extra cooked beans can be frozen so you're all set for the next time. Canned beans are fine too, just be sure to choose Eden brand. There is no BPA (bisphenal A) in the can lining so you don't have to worry that these hormone disrupting chemicals have leached into the beans). For the tomatoes in the recipe consider non-canned options, including jars of strained tomatoes, or bottles of basic pre-made tomato sauce. Heat 2 Tbsp. of the oil in a large, heavy pot over medium heat brown the ground turkey until there it is no longer pink. Remove to a bowl. In the same pot, heat the remaining 2 Tbsp. of oil and sauté the onions, jalapenos and red pepper. Add garlic, tomato paste and chili powder and stir to combine. Add tomatoes, turkey (with juices), beans and broth. Bring to a simmer, add oregano, molasses and salt to taste.